The election of Donald Trump as president of the United States, is nothing less than astonishing. In the wake of it, many like myself are feeling numb, betrayed, fearful, and downright ashamed of our country. A dear friend told me that her mom, who grew up in Nazi Germany, had lapsed into tears and was experiencing flashbacks of childhood traumas. Indeed, for those who have witnessed first hand the fragile vulnerability of human nature, the ease with which we slide into cruelty and barbarism, the election of Trump is very frightening indeed. Especially so in the broader context of rising nationalism and ultra right-wing white supremacists both inside and outside of the US. The antidote to despair, as we are often admonished, is activism. Appropriately, activists all around are gathering themselves together and vowing to "fight harder than ever". It is, after all, the only thing we CAN do, and therefore it is what we MUST do. Even as the stakes seem so high, and the obstacles so insurmountable, we put one foot in front of the other. So this morning, I headed over to a friends house where we packed a large van full of equipment and warm clothing - blankets, hand-made woolens, an entire crate full of the finest warm socks from Vermont's Cabot Hosiery, where my neighbor collected donations at the traditional annual fall sock sale. These goods are to be delivered to the Standing Rock Sioux encampment in North Dakota. We packed our offerings into the van and drove down the road to a tiny public park in our rural Vermont town of Hinesburg, called Geprags Park. The park land was given to our town by Dora Geprags, now deceased, who included in the deed transferring her land to the town a covenant that the park be maintained for "recreational and educational uses" only. Yet, for the past nine months, we have been fighting with all our might to protect Geprags Park from construction of a fracked gas pipeline. Our town sold us out, our state agencies are more interested in protecting corporate interests than people (yes, even in Bernie Sanders state), and it is now up to us to fight "harder than ever" to protect our park, our community, and our kids futures. 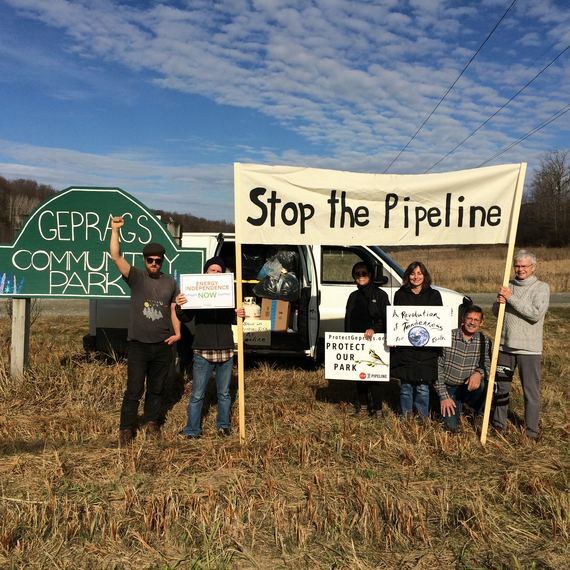 Vermonters have been fighting this pipeline for 3 years now. This park is the last piece of the route that remains, and the company, Vermont Gas, owned by Gaz Metro and ultimately Enbridge, is champing at the bit - frustrated by our opposition, eager to finish the pipeline and start recouping their bloated costs. We are fighting on land that rightfully "belongs" to the Abenaki peoples. We also are fighting to protect our water. Our park is home to pristine wetlands and habitat for rare golden winged warblers. This small gesture is our medicine - soothing the numbness and the apprehension we feel as Donald Trump takes the helm of our nation. We busy our minds and souls with socks and mittens, blankets and prayers. Really, we know that it is these small gestures that will sustain us - gifts of support, kindness and solidarity cast out far across the divides of history and space, from Hinesburg to North Dakota.